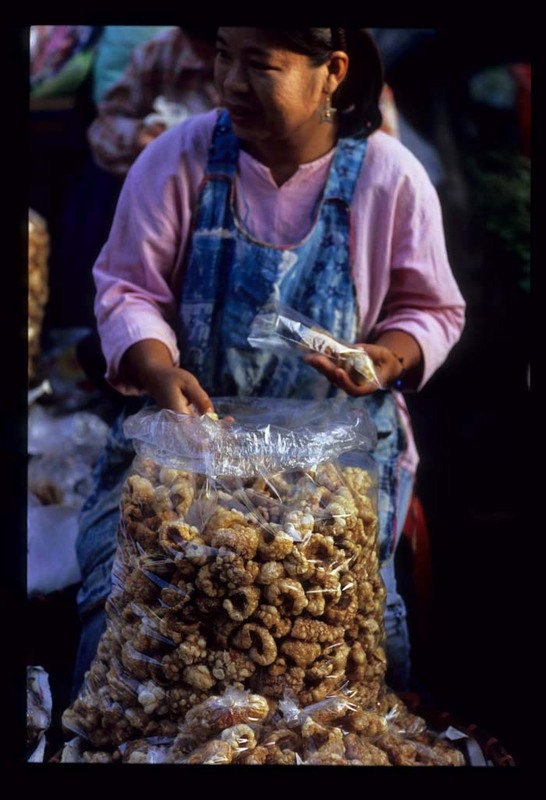 What makes a market in Thailand a northern Thai market? 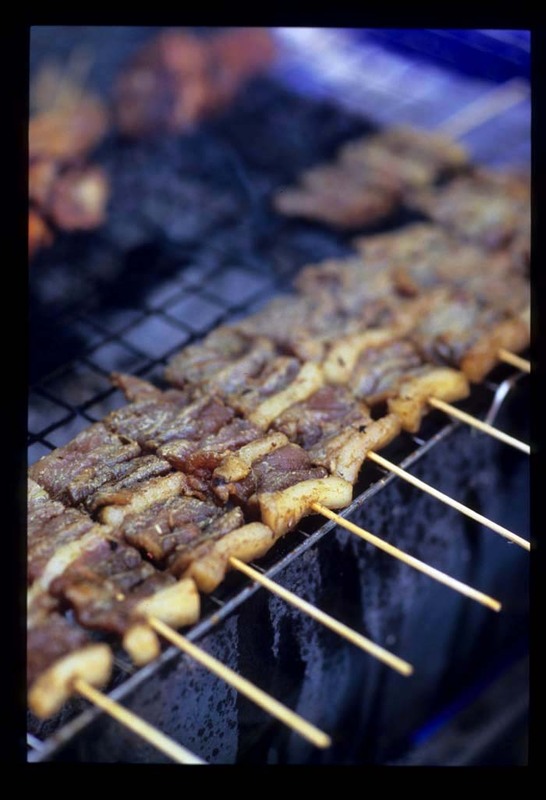 Pork is enjoyed in much of Thailand, but nowhere as much as in the northern provinces. Stand in the middle of a food market in northern Thailand and toss a pebble. Chances are it will land at the feet of a vendor peddling something porcine. Here, no part of the pig goes to waste. Not the head. Not the slabs of fat, destined to be melted in a hot pan or wok for a stir-fry. Not the heart, liver, stomach, and assorted other innards which, along with skin, might end up in a northern-style laab, a chopped meat 'salad' spicy from chilies, black pepper, long pepper, and makhwem (a northern Thai variety of prickly ash) and heady with the scent of dry spices like coriander, cardamom, nutmeg, and cumin. 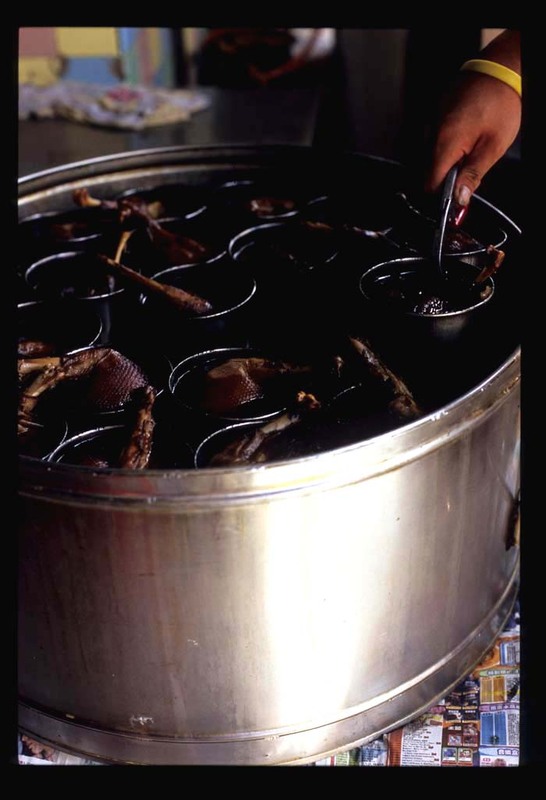 Nor the blood, sold as a liquid to be mixed into laab (both laab dip - uncooked - and laab khua - cooked) or in the form of lightly set 'cakes', to be diced and added to kanom jeen nam ngiaow, skinny fermented rice noodles with a thin, lightly soured sauce/gravy of meat and tomatoes. 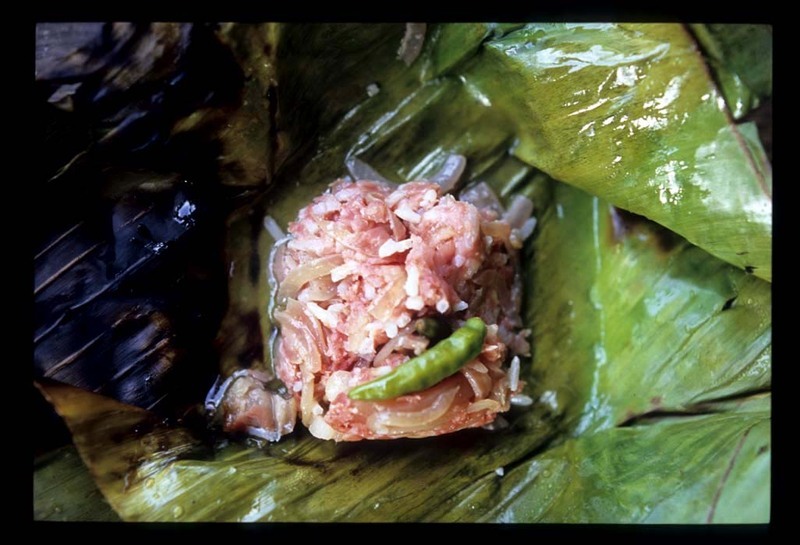 Northern Thailand's hills hide culinary treasures - like wild boar. 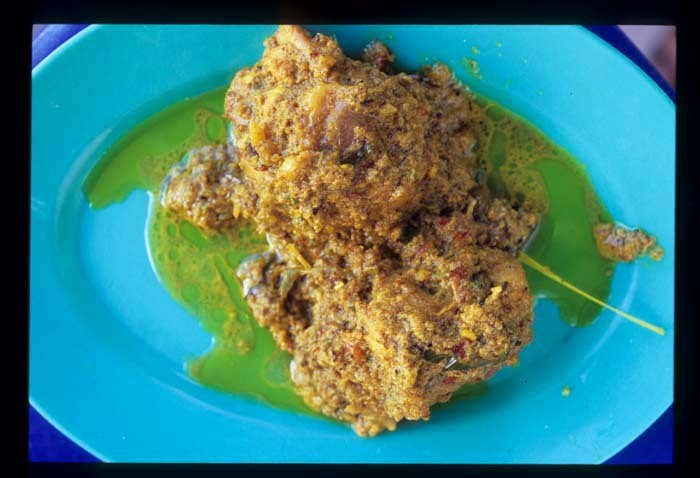 Its gamey essence adds heft to curries and its skin, deep-fried, makes for a delightful snack. It's hard to pass a day in the north without encountering pork rinds, wild or otherwise. 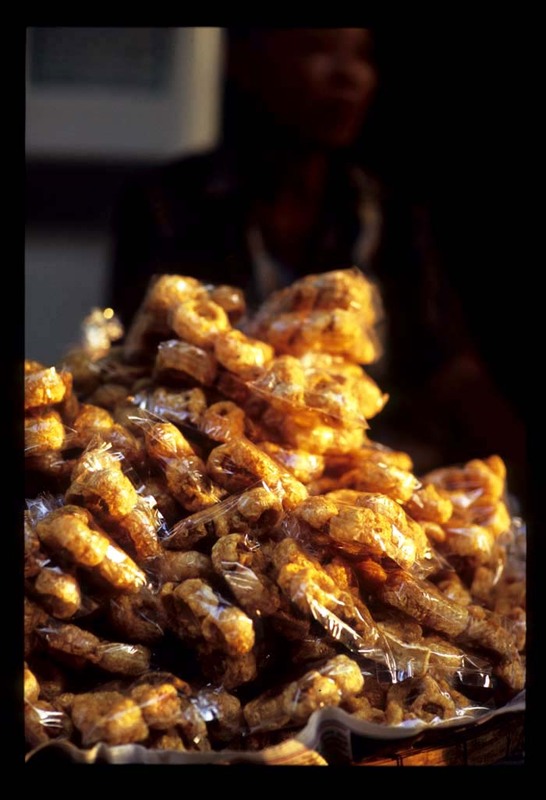 They're eaten on their own, used to scoop dips, added to curries, crumbled atop noodles. It wouldn't be a stretch to say that they are essential to the (non-Muslim) northern Thai diet. 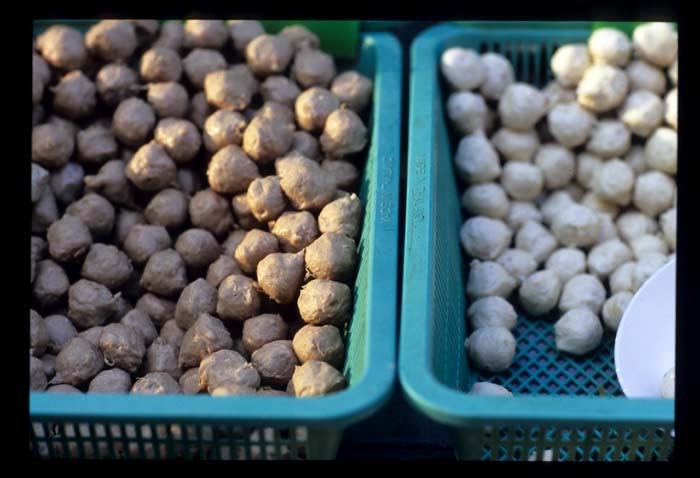 Pork balls - for noodle soup, mostly - are a fixture of just about any Thai market, but here it's not unusual to encounter a vendor offering up to ten varieties. 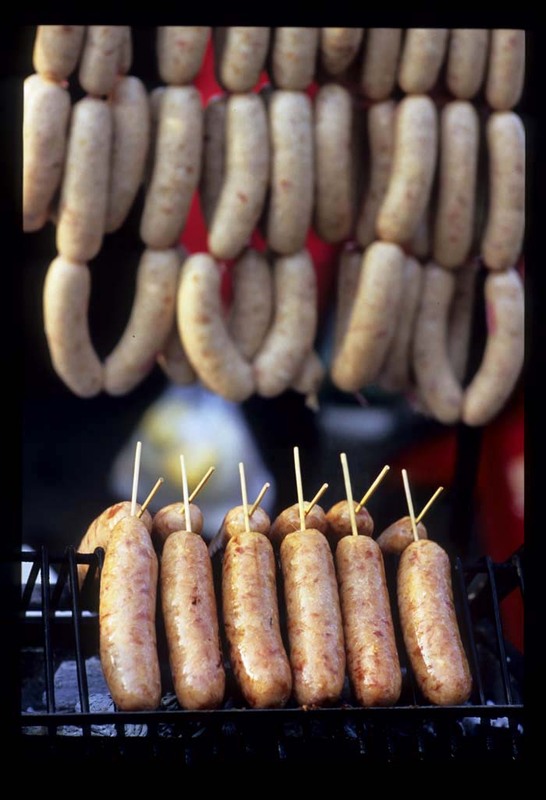 There are, of course, sausages: sai oua (smoked sausage seasoned with curry paste), sai krawp priaow (sour sausages of pork fermented with glutinous rice), and sai krawp wunsen, which substitute wunsen (bean thread noodles) for sticky rice. 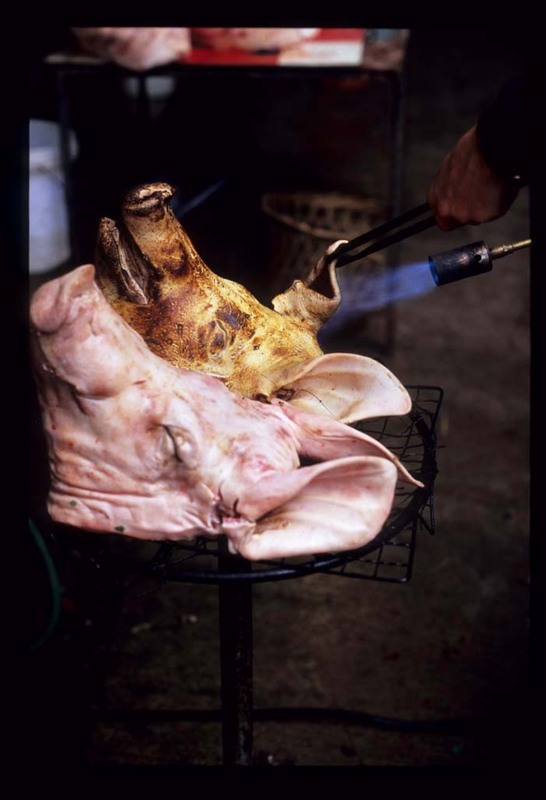 Fermented pork is a northern specialty. 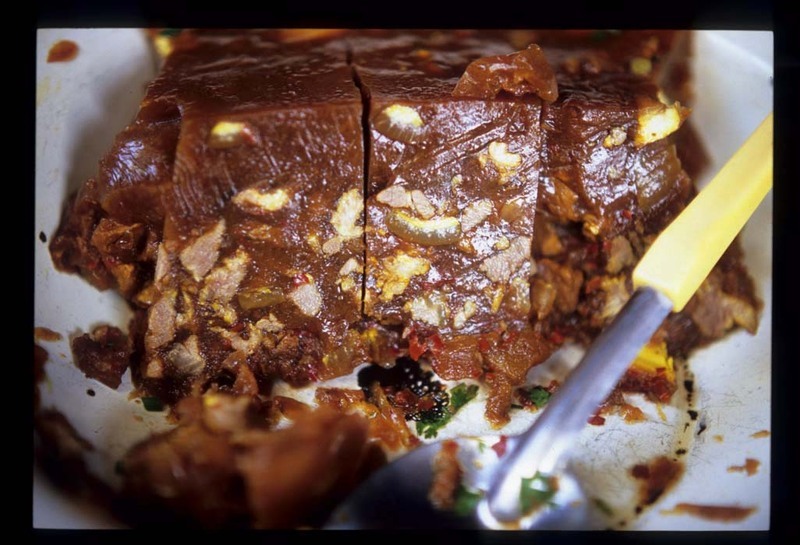 For naem, the meat is chopped, mixed with glutinous rice and shallots and/or garlic, packed into a clay pot, and left for exactly three days to sour. 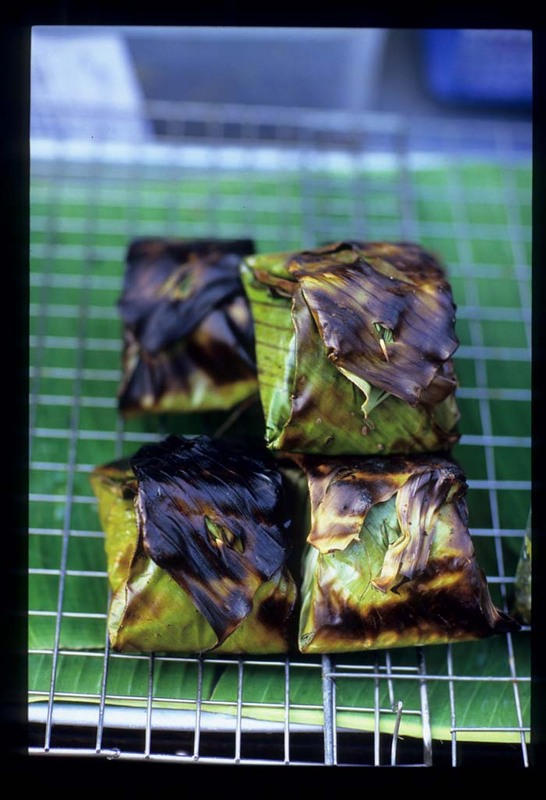 Naem needn't be cooked (in a way, it already is), but is especially tasty wrapped in a banana leaf and placed over a grill, so that the meat absorbs the fragrance of the green. Eaten with a couple of fiery chilies softened from the heat and accompanied by a glass of strong, sweet Thai coffee, naem makes for an excellent early-morning market breakfast. 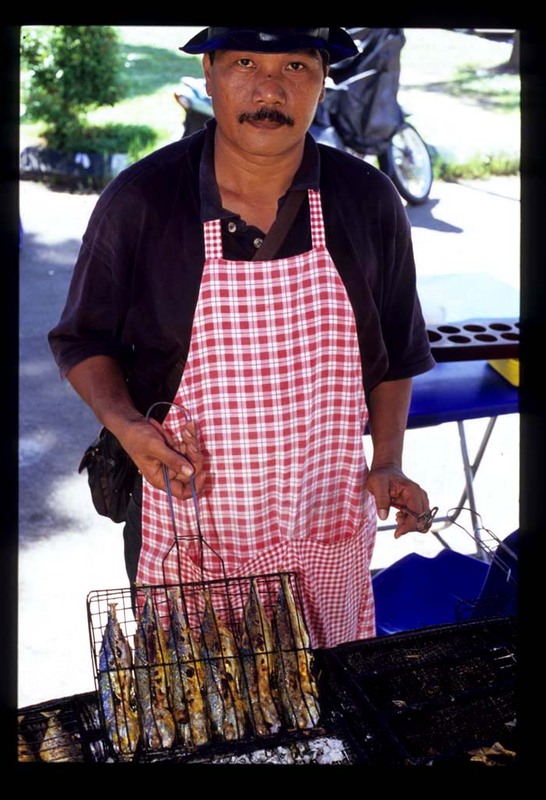 No Thai market is complete without a mobile vendor selling muu yang, grilled skewered pork. Up north the cut of choice is belly, which makes for a wonderfully (and sinfully) fatty snack. 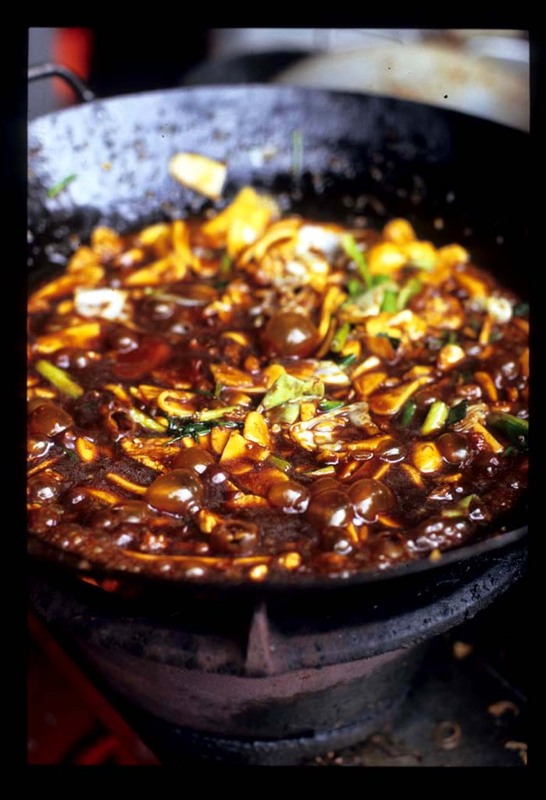 Every northern market features a range of pork-centric prepared curries. Especially worth seeking out is gaeng kadang, a sort of pork curry 'jelly' set with sago-sago. 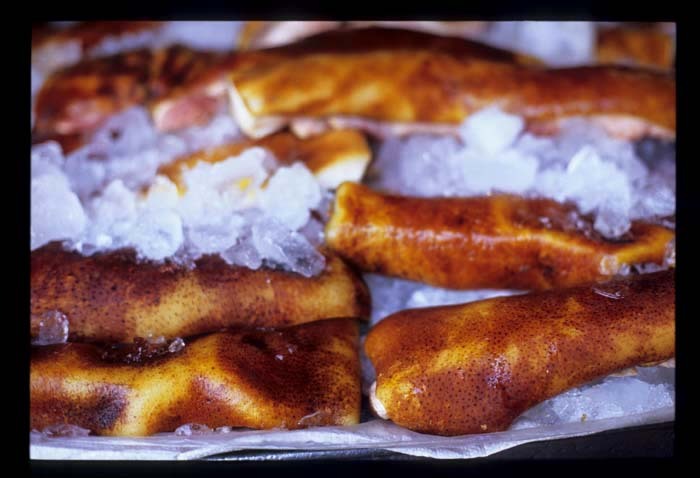 Meaty, spicy, flavored with a combination of dried spices and fresh herbs, it holds its shape without refrigeration, making it the perfect travel food. And it tastes about one hundred times better than it looks. This is Apple. We posted about her a few weeks back (before she had a name). Dave and I rescued Apple, and her five brothers and sisters, and her mother, from an abandoned house in our neighborhood about six weeks ago. All of Apple's siblings have found new homes (many thanks to the generous adopters!! ), but Apple is still waiting. We would love to keep her, but our house is awfully full: 4 cats and 2 dogs (one of them is Apple's mom). We've received inquiries from good-hearted Malaysians who shy away once they learn Apple is a female. Why? 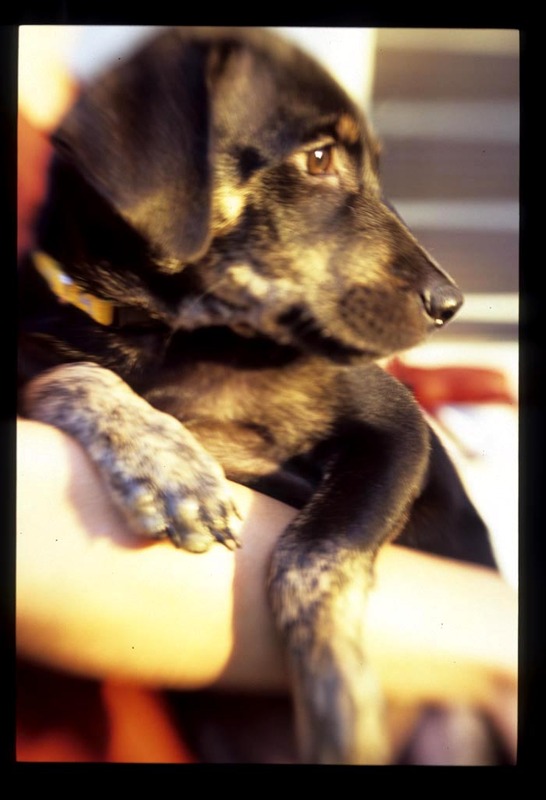 Female dogs, many people think, mean male dogs sniffing around the yard, messy and disruptive 'heats' (when the female is ready to mate), and, possibly, puppies. Not so. A simple surgical procedure called 'spaying' - very common in the US - prevents all these problems. 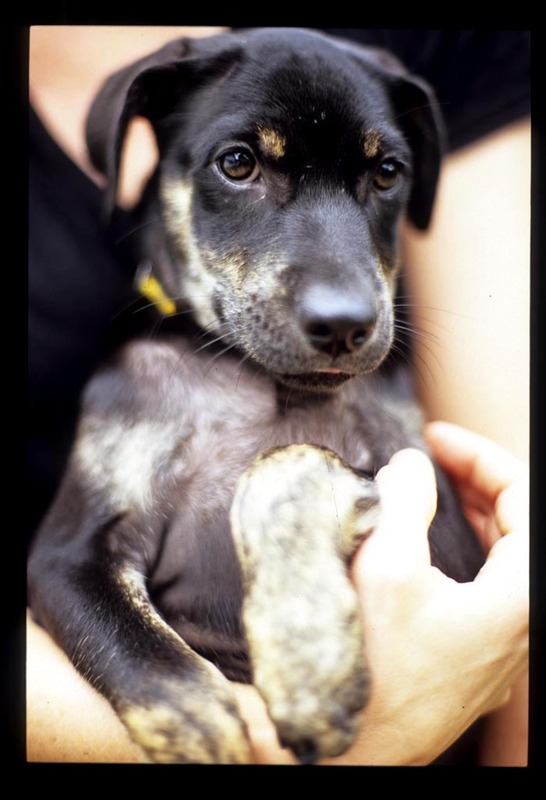 A spayed female will not go into heat, will not attract male dogs, and cannot have puppies. 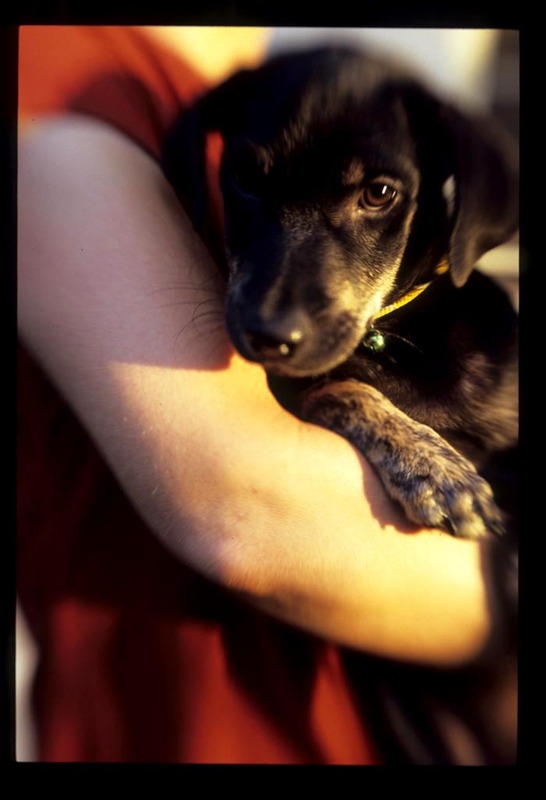 Spaying requires just 2-3 days of hospitalization. It will not make a dog lazy or fat. It will make her a better pet. Please read this, prepared by the American Humane Society - an organization dedicated to bettering the lives of dogs and cats in the US - to learn why spaying is good for the animal and good for the owner. Apple is about 10 weeks old. She is quiet and shy with strangers, but playful and extremely loving once she gets to know you. She loves to play with her ball, chew her rubber bone, and cuddle. She would be perfect for anyone looking for a lively, but not too rambunctious, pup. She is up-to-date on all her vaccinations, and we are offering a 'voucher' to completely cover the costs of spaying when the time comes (about 6 months of age). Please help us find a home for this sweet pup. If you're interested, or if you know someone who knows someone who knows someone who might be .... well, you get the picture. Thanks. We'll get back to eating Asia tomorrow. Dave and I are finishing up our tenth year in Asia and we're still in the 'discovery' stage. Our newness is brought home to us everytime we hit a food market, be it here at home in Kuala Lumpur or on our travels around the region. No matter the locality, no matter the time of year, we're almost always guaranteed to stumble upon something - fruit, vegetable, ingredient, prepared food - we've never seen before. We found this smooth-skinned, heavy fruit on our first morning in Chiang Mai, at Myang Mai morning market. Two vendors, each with a single basket of fruit, told us it grows wild on Doi Ang Khang (aka Thailand's 'Little Switzerland' and home to one of the King's Royal Agricultural Projects). Called dien taw, the fruit was fetching the exceedingly high price of 60 baht a kilo (about 75 US cents a pound). As Dave took photographs Thais wandered up to examine the fruit. Not a one had seen it before. 'So sweet', the vendors assured us. 'Eat it when it's very, very soft'. We bought a couple, took them back to our room, placed them on the dining table, and forgot about them. Four days later, as we were readying to leave Chiang Mai for Nan province, I remembered the dien taw. 'Don't forget to pack the weird fruit!' I called over to Dave (who usually does most of our packing). And four more days later, as we were preparing to drive north from Nan: 'Be sure to grab the weird fruit!' Which, more than a week after we'd bought it, was still rock-hard. The weird fruit accompanied us north and then west, to Fang and Tha Thon and Ang Khang, and then back down to Chiang Mai. Three days later we - and the weird fruit - were back where we'd started, in Chiang Mai. And finally, it was starting to soften. The next morning we headed back to Myang Mai market. There were dien taw - baskets and baskets of them - everywhere. Not just at Myang Mai but at Warorot market as well, nestled next to avocadoes and surrounded by plastic-wrapped styrofoam trays of red globe grapes and peeled pomelo. We'd apparently hit the height of dien taw season, for the price had dropped to 20 baht a kilo. 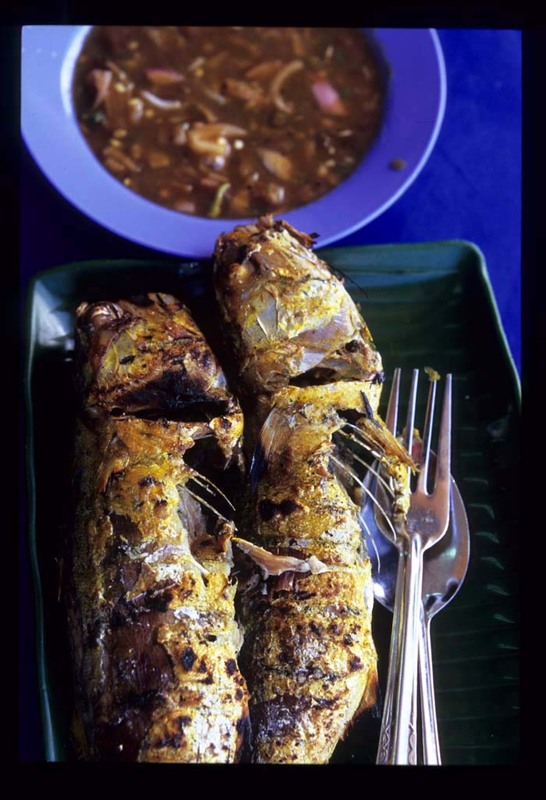 Two days later our 60 baht-a-kilo dien taw was 'very, very' soft and ready to eat. I cut it in half to find two burnished brown seeds and smooth, starchy golden flesh. Dien taw's texture is a cross between that of a rich, dense Haas avocado and cooked butternut squash, and its flavor is quite like the latter. The flesh is a bit dry and exceedingly sweet, but weird, not at all what I think of as 'fruit-like'. I'd be more likely to eat dien taw hot and mashed, mixed with butter and sprinkled with salt and pepper, than out of hand. Update: Mystery solved, thanks to vigilant EatingAsia reader Bobbie (see comments section), who directed us to this picture of the weird fruit on the tree. The fruit is a lucuma, native to the Andes mountains of Chile, Peru, Bolivia, and Ecuador, where it is eaten out of hand or made into ice cream. 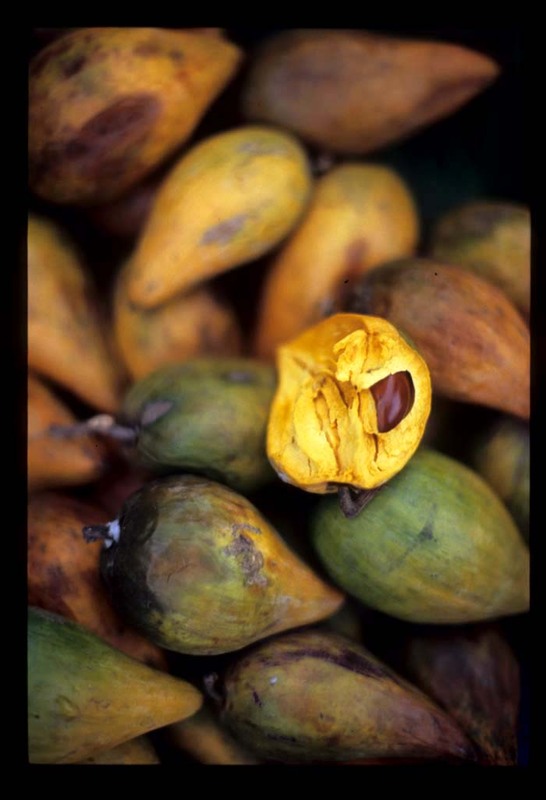 This site describes the lucuma as having thin skin and 'dry and starchy orange-yellow flesh' - a description that fits the weird fruit to a 'T' - and notes that in Peru and Chile, where the most lucumas are grown, only a small percentage reach the market in the raw state. Most are dehydrated and ground to a powder that is used to make ice cream and other milk products. South American lucuma are in season January to April. 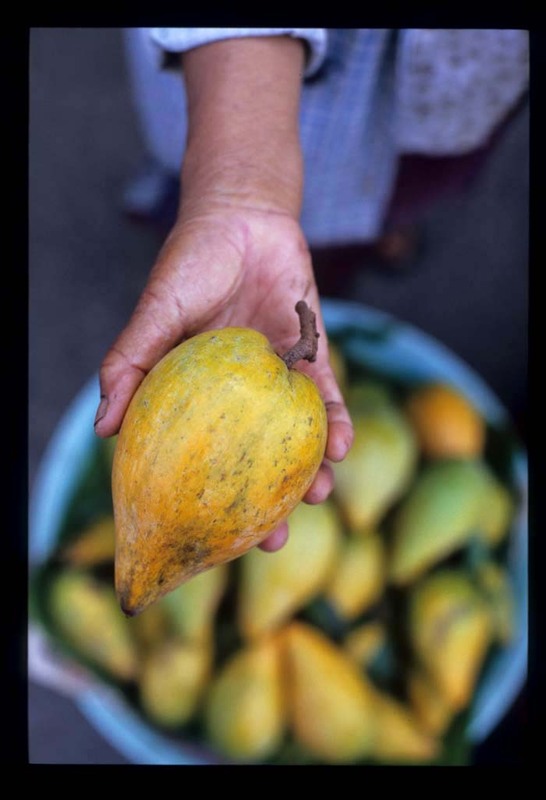 The question is, how - and when - did the fruit make its way from the Andes to the mountains of northwestern Thailand? 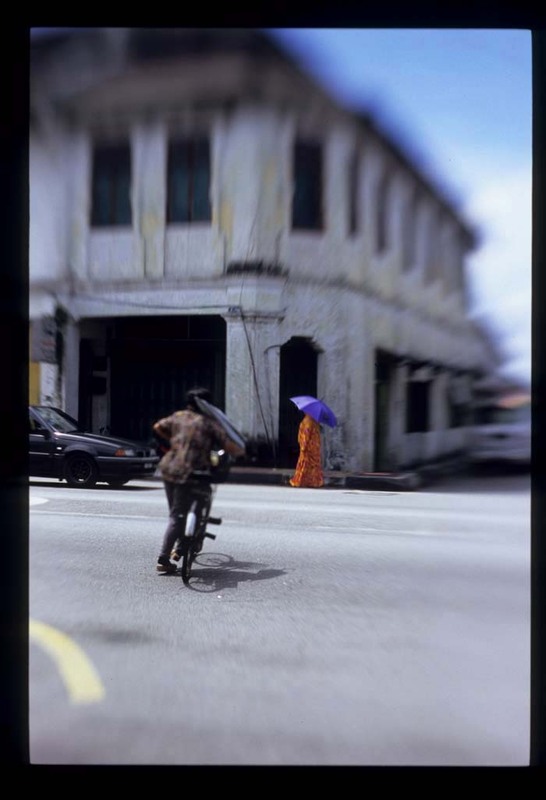 Once upon a time, before Malaysia built its efficient, rest stop-dotted North-South highway, the only way to travel between Kuala Lumpur and Ipoh was via two-lane blacktop. The journey took twice as long in those days, but I doubt anyone minded. You see, there's culinary treasure on the trunk road to Ipoh. 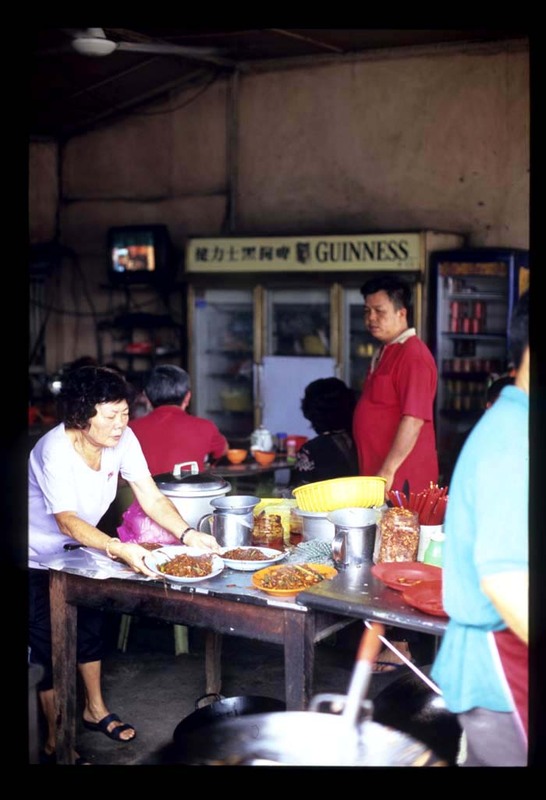 In the 19th century Perak state saw a massive influx of Chinese immigrants, drawn by the discovery of tin. 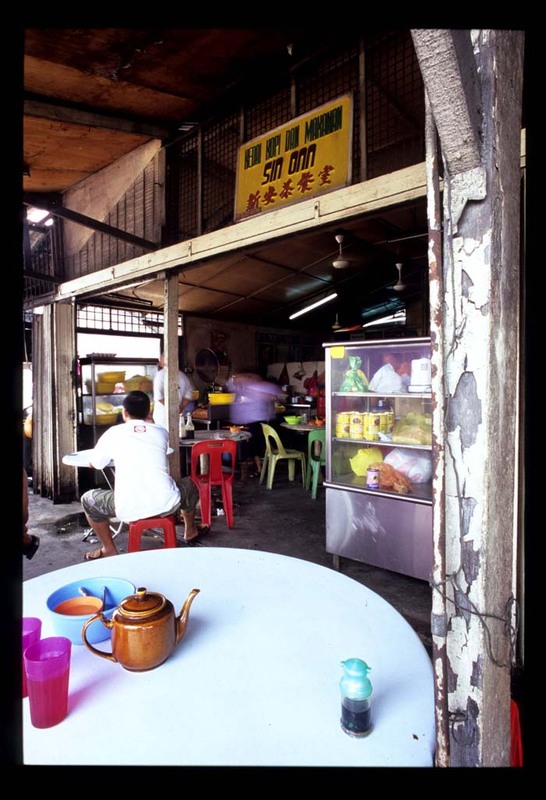 Though the fortunes of trunk road towns like Kampar have faded with the decline of the tin industry, they are still host to eateries offering the (mostly southern Chinese and Hakka) specialties of the immigrants and their descendents. Bidor is one such town. Its main street - the trunk road - is lined with a mixture of grand but crumbling old shophouses and contemporary concrete block uglies. It's population looks to lean towards very late middle age. There's no hustle or bustle in Bidor. 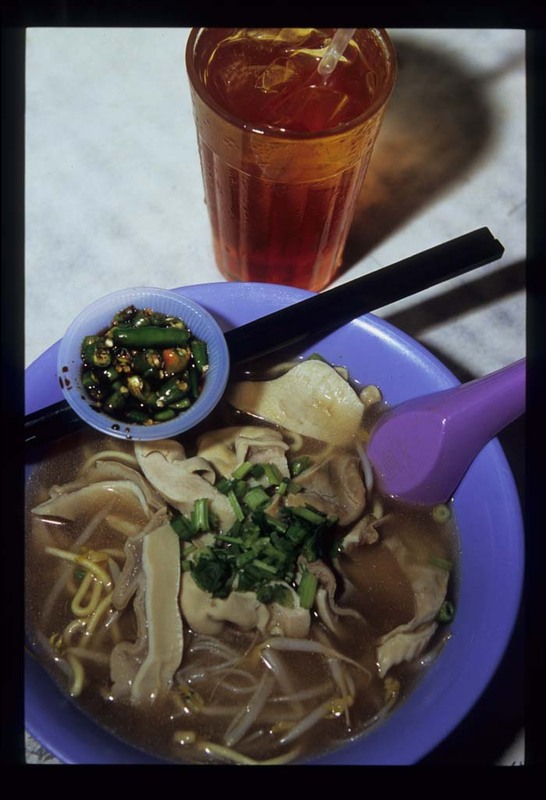 But there is Pun Chun, and there is Pun Chun's duck noodle soup, a dish that is known to probably every single Malaysian living on the country's west coast. Malaysians travelling between KL and Ipoh divert from the highway just to dine at Pun Chun. And many make the 3-hour roundtrip journey from KL just for a meal. We joined the ranks of the latter a few weeks ago. 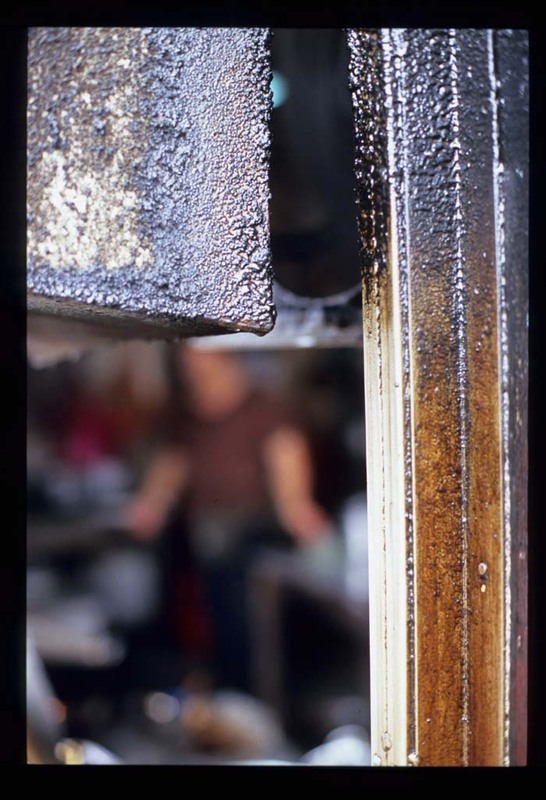 Pun Chun has been in business nearly seventy years. 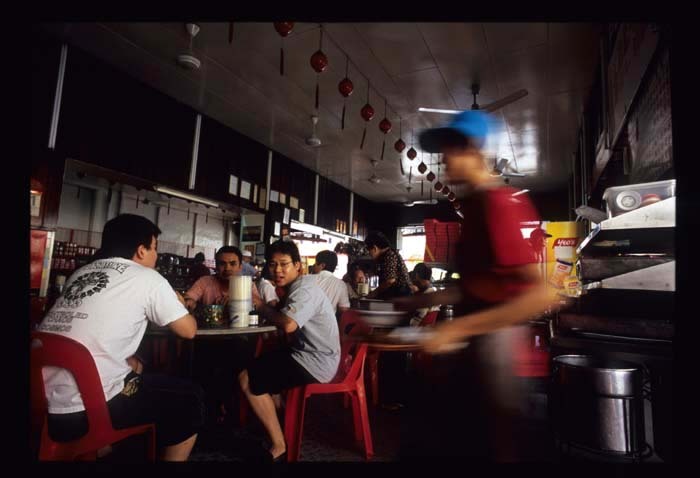 It's your average Malaysian coffee shop: long and narrow, open-aired, high-ceilinged, fan-cooled, noisy, populated by a mix of regulars and food tourists. and then moving them, in their individual pots, to an oven. 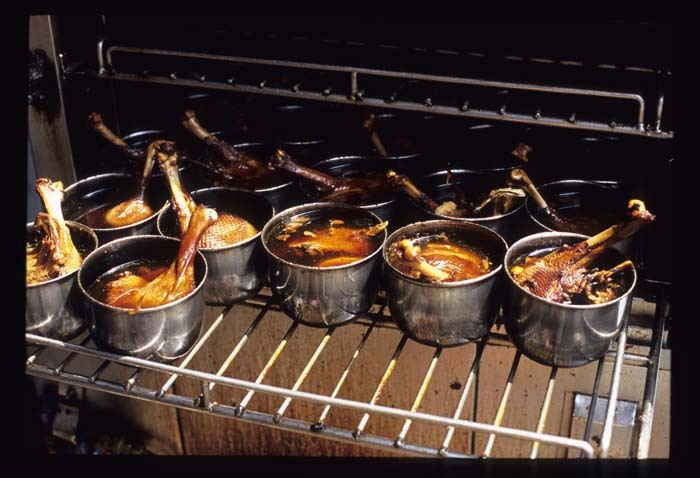 The thighs are pulled from the oven to order and transferred, along with their broth, to a deep bowl. Some patrons order their noodles 'dry' (tossed with seasonings and served on the side). Some skip noodles altogether and opt for a double order of duck. 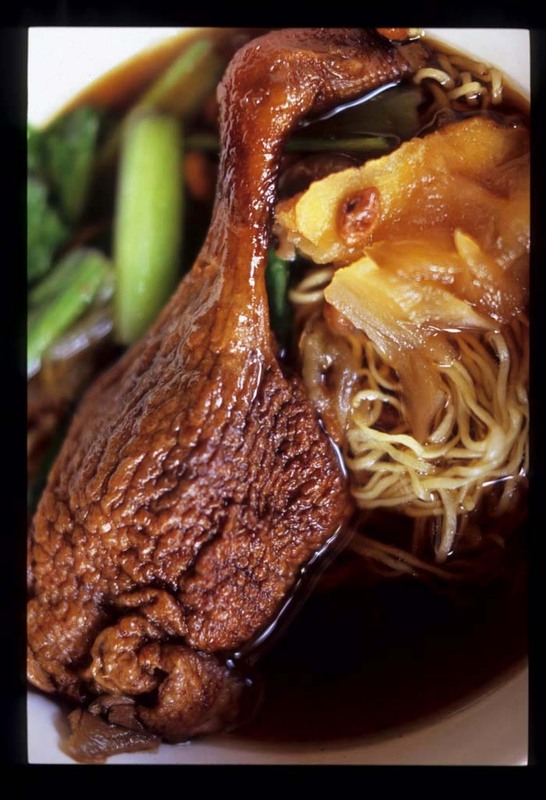 but is justified by the mahogany-colored duck meat, thoroughly permeated with herbs and so tender that it falls off the bone with barely a nudge of the chopsticks. Long, slow cooking reduces the skin to little more than tissue paper and Pun Chun's slender, springy noodles are perfectly al dente. 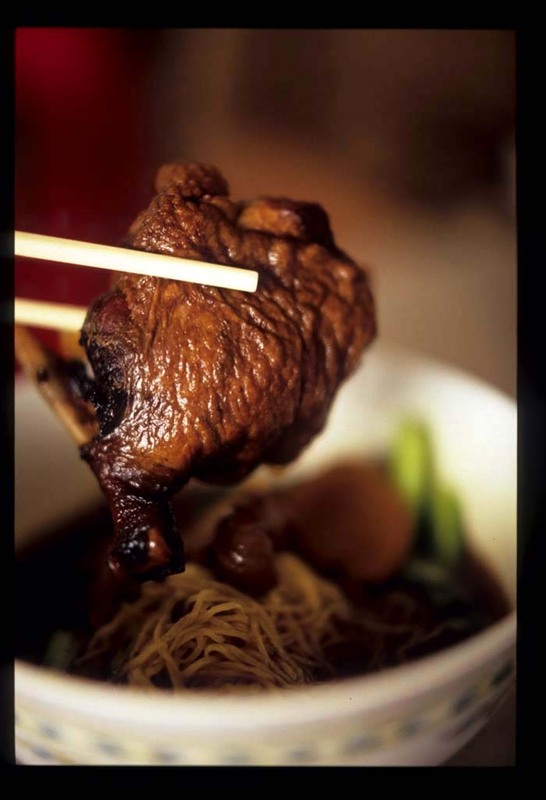 Those crazy enought to pass on the Pun Chun Ngap Pei Mee Experience might investigate the coffeeshop's roasted meats stall, which serves up fragrant duck, moist chicken, expertly done pork, and chewy, slightly sweet sausages. Indecision can be cured with a mixed plate, a sort of 'meat salad' of roasted bits in a pool of light meat juices, bedded on sliced cucumber and topped with grated carrots and chopped cilantro. 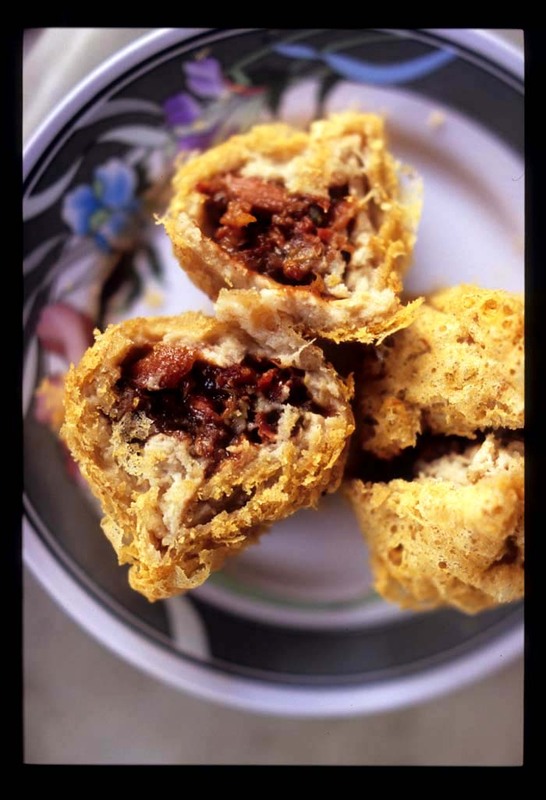 Every visitor should order the woo kok, char siu-filled mashed taro dumplings dipped in batter and deep-fried. Covered with just a wisp of greaseless, crunchy batter, these 'taro puffs' are almost worth the drive in and of themselves. There's also a display case with a fantastic selection of baked goods - including kaya puffs, pastries plump with lotus seed paste, and an intriguingingly spiced flat, round biscuit filled with a mash of dried fruits - to stop in front of on the way out. Pun Chun, 40 Main Road, Bidor. Tel. 05-434-1554. Open from the crack of dawn till 10 at nite. 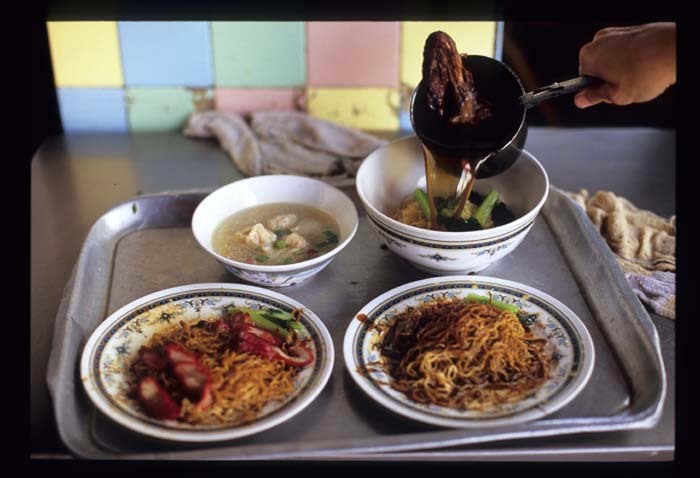 Is Malaysian food finally getting its due? Locals, any comments on accuracy and/or choice of venues? There are not many purple foods. That's a good thing, for the food photographer. On vittles, purple is not a particularly photogenic tint. A purple dish does not make for a droolworthy photo. So you're just going to have to trust us on this one. They may not look it, but these unevenly shaped blobs of purple dough - called abacus beads (or abacus seeds) - are a delight. 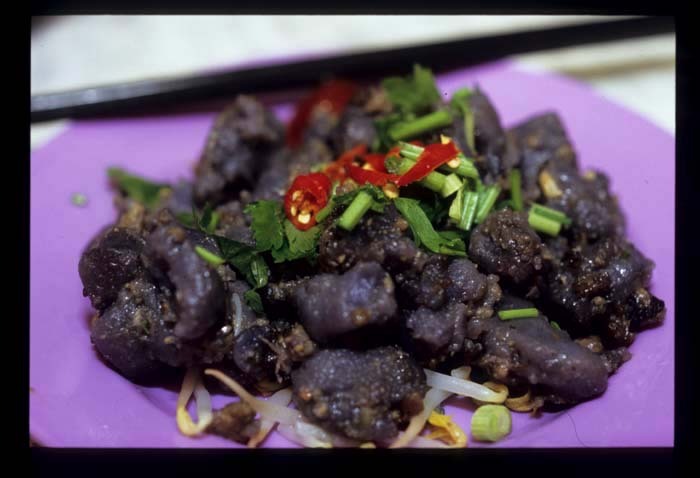 Fare of the Hakka Chinese dialect group (creators also of yong taufu, liu cha, and rich porky dishes like char yoke), abacus beads are made from a kneaded dough of steamed taro (white or purple) mixed with tapioca flour. Marble-sized balls of dough are 'dimpled' with the thumb, boiled in water until they float, then drained and tossed with oil to keep them from sticking together. 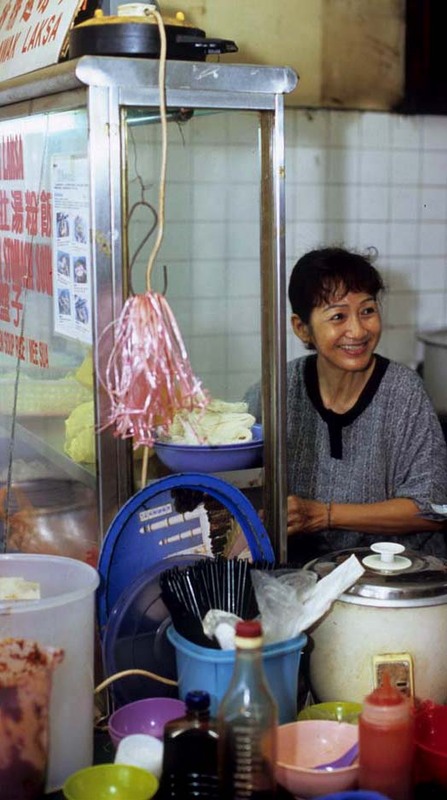 This Bangsar vendor, a Hakka hailing from Kuching who's known for her stunning Sarawak laksa, fries her abacus beads with dried shrimp, bits of pork, a touch of soy sauce, and loads of white pepper. An exceedingly skillful fry job it is; the beads absorb little to no oil. They're served, room temperature, on a bed of ever-so-slightly blanched bean sprouts and showered with chopped Chinese celery and red chile. Blandish, chewy dough comes head-to-head with crunchy sprouts and celery and the zing of white pepper. A dab of sweet tomato-chile sauce is served on the side, but it's extraneous. Porky meatiness and dried shrimp saltiness are all the seasoning these abacus beads need. This lady of many talents also offers up a fine, tongue-tingling pepper-and-pork stomach soup, to enjoy plain or with noodles. Even an innard equivocator like myself has to admit that, as guts go, this is a tasty preparation. Abacus beads and pepper-pork stomach soup (and Sarawak Laksa), Nam Chuan Coffeeshop, Lucky Garden, Bangsar. Early morning till late afternoon. Closed Wednesdays. 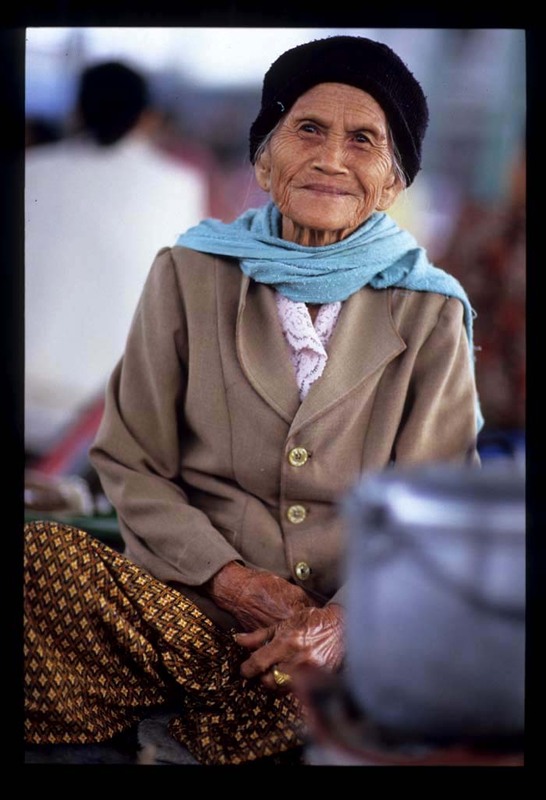 At a village market not far from the Burmese border an elderly vendor draws our attention. Actually, it's her cigarette that catches our eye. It's enormous, more cigar than cigarette, and she puffs slowly, savoring it with an air of quiet contentment. The stalls in this market are wide, low-to-the-ground wooden benches. Like other female vendors she sits cross-legged on her stall, within easy reach of her products and her moneybox. (The few male vendors remain on their feet - or rest on a stool - behind their benches). At her left knee a worn metal pot of water simmers over a brazier. 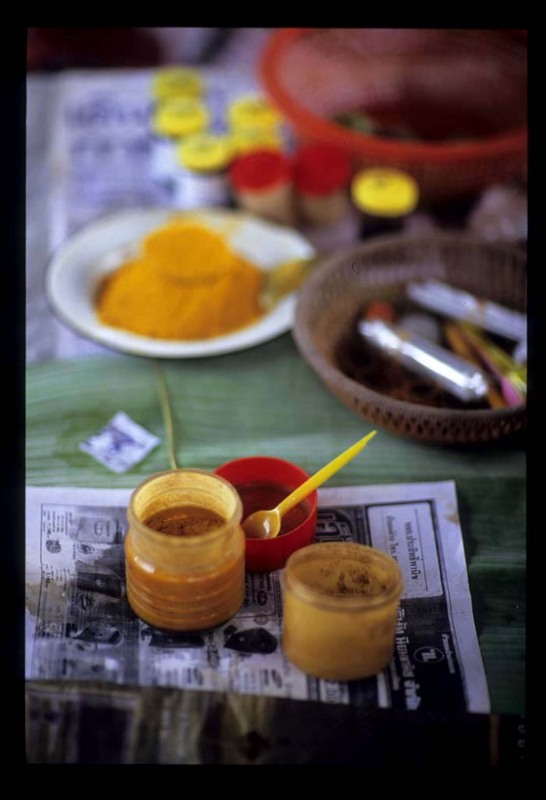 To her right, jars and bowls of powder in shades of orange rest on banana leaves and old newspapers. A tray of unmatched plastic and ceramic cups sits at her feet. I ask what's for sale. It's 7am and a thick, chill fog blankets the streets outside the market. A hot mug of anything sounds inviting. Naam yaa translates as 'medicine water' - how could we go wrong? She ladels nam yaa into two cups. It's thin and dark brown like strong tea, and exotically spicy, deliciously sweet, and utterly reviving. I try to guess what's in it. Phrik thai (black pepper)? Yes. But this is really no surprise, because my tongue is still tingling minutes after I've finished my cup. King (ginger?). No. Kha (galangal?). No. Cinammon? She nods, then points to the yellowest of her yellow powders. Ah, turmeric. But no, it's not, she says with a laugh. I give up. A huge array of dried spices figure prominently in any northern Thai market, and any of them could be an ingredient in naam yaa. 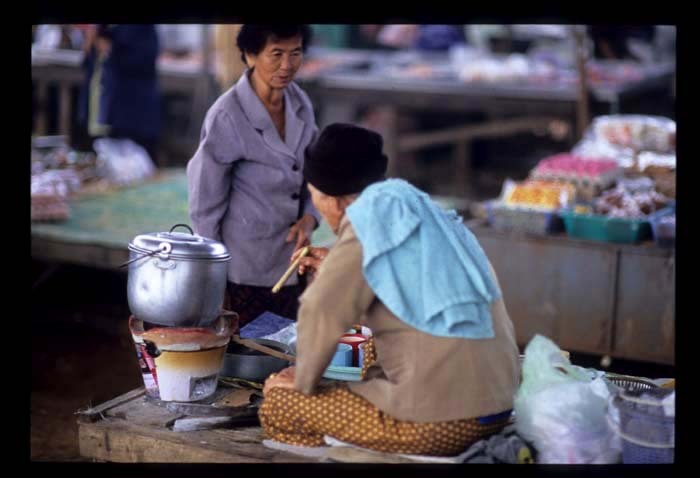 At another market up the road, a naam yaa vendor tells us that she doesn't know exactly what's in the drink because she buys her powder, premixed, by the kilo (1000 baht - about 25 US dollars - a bag). 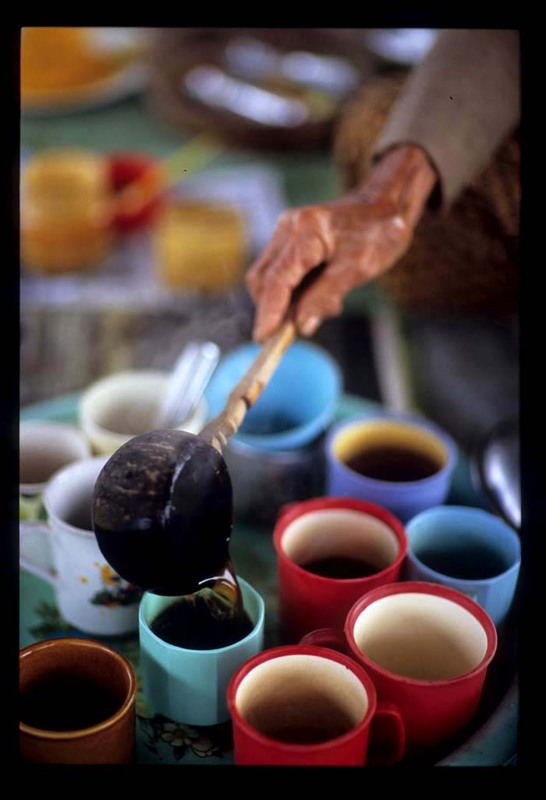 She adds naamtaan ooi (brown cane sugar) and sells the drink for 1.5 baht a cup. Whatever's in naam yaa, we can't argue with its effects - one cup each and we're energized, good to go for another hour. 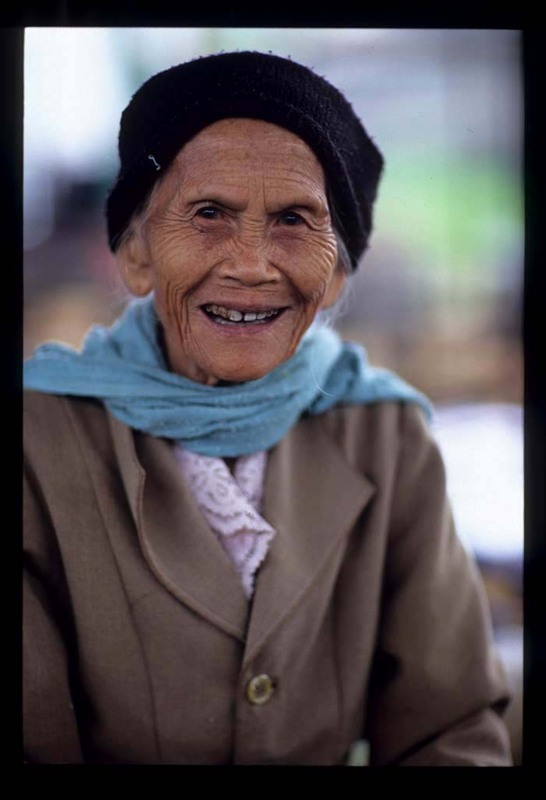 Our vendor - clear-eyed, lively, exuberantly chatty, and in obviously excellent health - is 81 years old. She takes several cups of naam yaa a day, she says. And recommends a morning smoke as well. Look for naam yaa in far northern Thai markets. This one is in Mae Ai, about 10 or 15 kilometers north of Fang. ... is not necessarily a bad thing. Not when it's the by-product of the same number of years of high-heat stir-frying that turns out this kind of deliciousness. 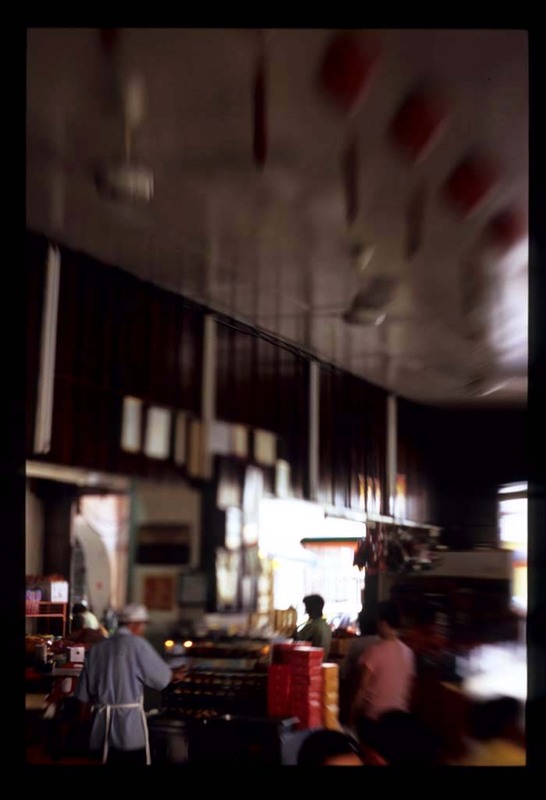 I'd describe Kedai Kopi Sin Onn as 'old-style', but that would be stating the obvious. It's a neighborhood joint, and its customers are a cast of regulars: twenty- and thirty-somethings whose parents introduced them to the place, middle-aged folks who've been patronizing it since they were kids, and old men and women who look like they've been around a decade or five longer than the shop has. Sin Onn resides in an ancient wooden shophouse. 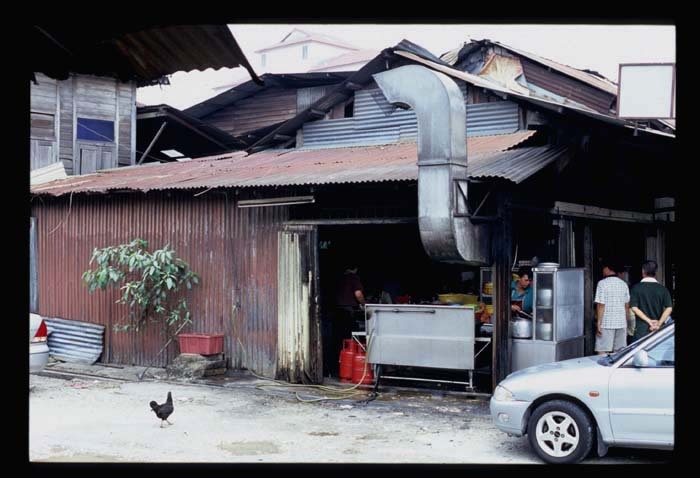 Its structure is tumbledown, its 'kitchen' an improvised space roofed and walled with corrugated metal, 'furnished' with a few high-BTU burners and ancient, rickety tables shoved together to make a prep area, and adorned with an industrial-sized vent. 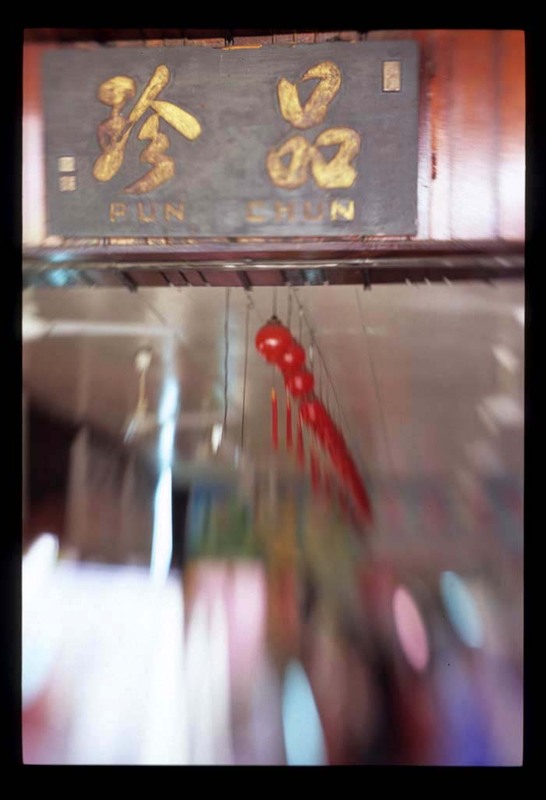 The coffeeshop has been in the same Hokkien (from China's Fujian province) family since it opened, when the neighborhood was still quiet and mostly residential and the four brothers who now run the place were knee-high or not yet a twinkle in their parents' eyes. 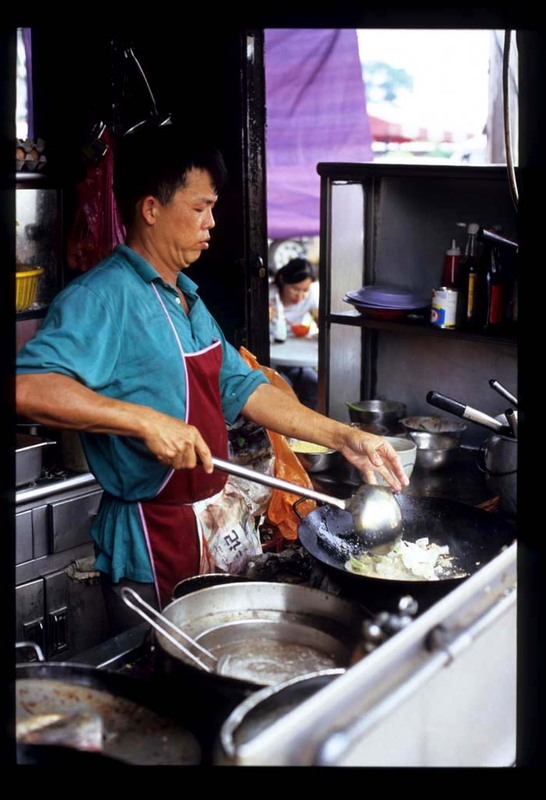 One brother mans the woks, the others help mom service the tables. 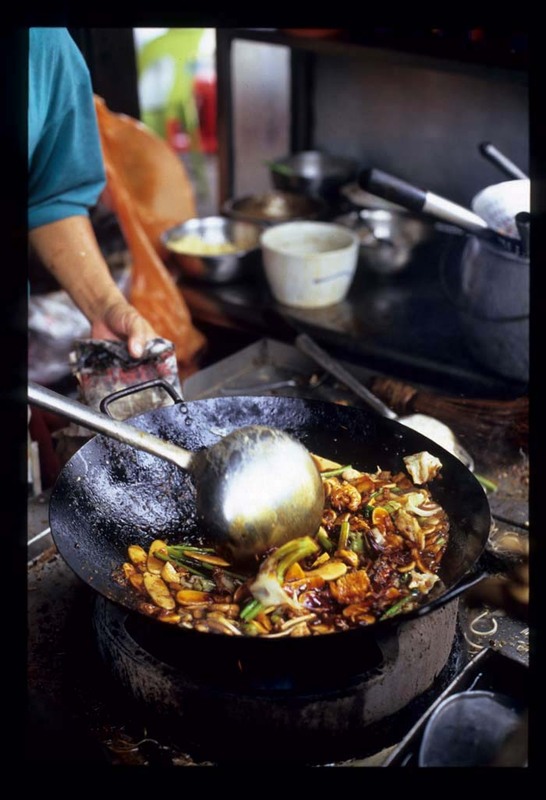 The place is busy and the wok-manship meticulous - at Sin Onn an order placed is not instantly filled. This allows plenty of time to take in the ambience. The blare of the TV is background to traffic noise and chatter in a few Chinese dialects. 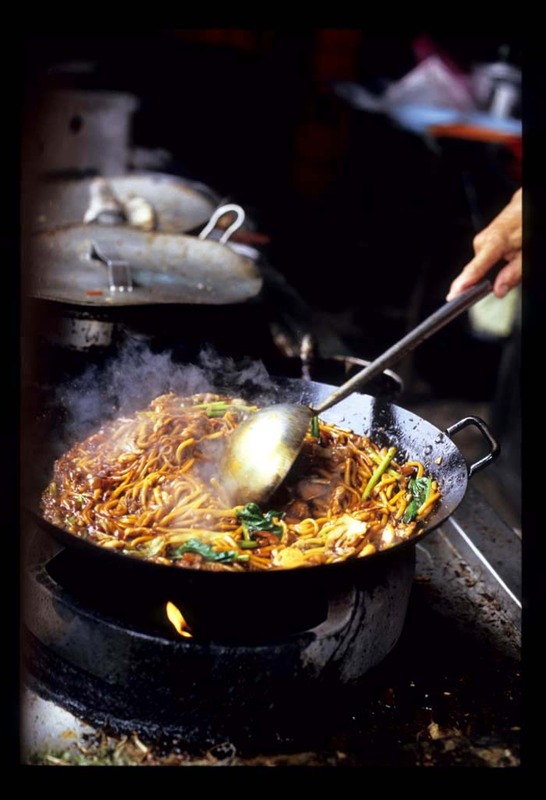 The clouds of smoke that billow from the kitchen and waft over the tables are carriers of the delectable scent of wok char. We're here especially for the peh keh (pak kuo in Cantonese), 'white cakes' made from rice flour dough. These thin, chewy oval 'coins' (a thicker, larger version of which - called nian gao - are popular in Shanghai) make perfect stir-fry fodder, greedily soaking up whatever seasonings a wokmaster cares to throw at them. 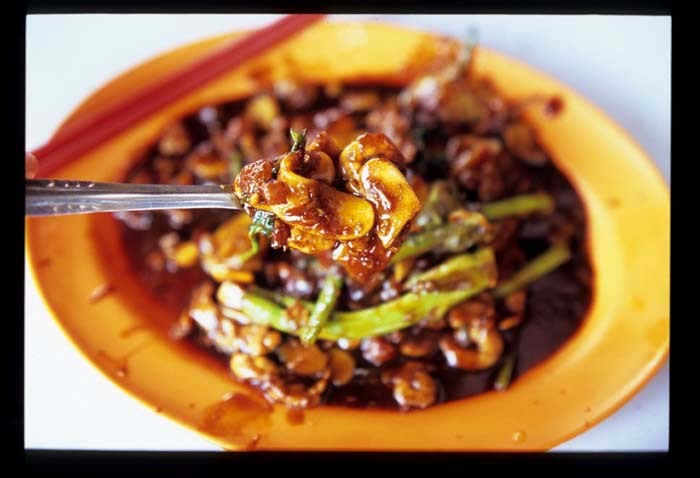 At Sin Onn they're tossed with small shrimp, slices of flavorful fish cake, and irregularly cut gailan (Chinese broccoli) stems and seasoned with lots of dark soy, then left to simmer long enough for the dough to absorb the flavors of the other ingredients. The result may not be especially pretty - no, they don't wipe the rims of the plates at Sin Onn - but it is exceptionally tasty: a slightly sweet, lightly bitter (accentuated by the gailan) peh kek that has, in spite of a fairly long simmer, retained a delightful, almost-gummy chew. 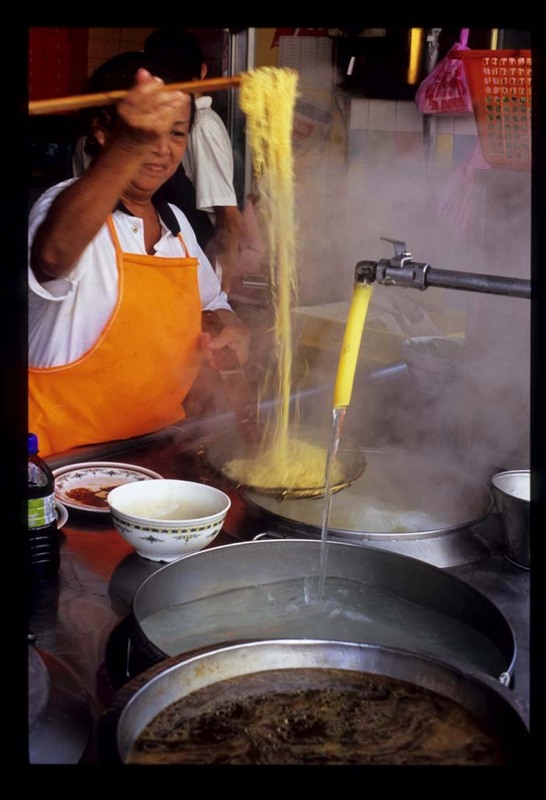 The same treatment - a fry followed by a simmer (see second photo) - is applied to Hokkien mee, that sinful Malaysian favorite of dark soy saucy extra-thick yellow noodles with pork and Chinese greens. 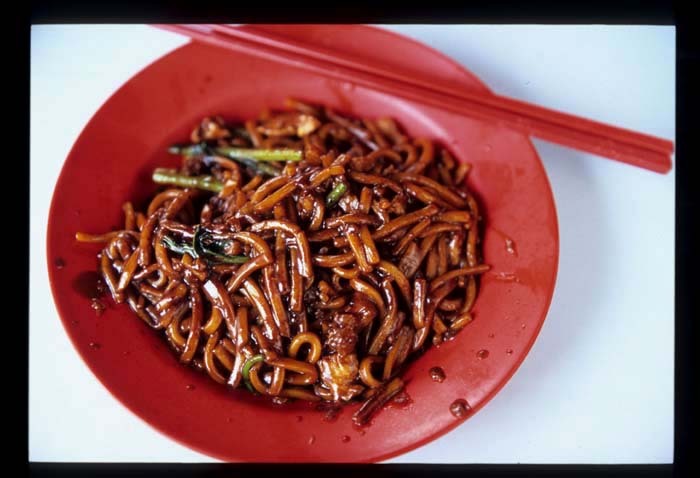 Hokkien mee connoisseurs insist that lard is an essential ingredient of any version worth its money; there's no doubt that pig fat coats the surface of Sin Onn's woks. 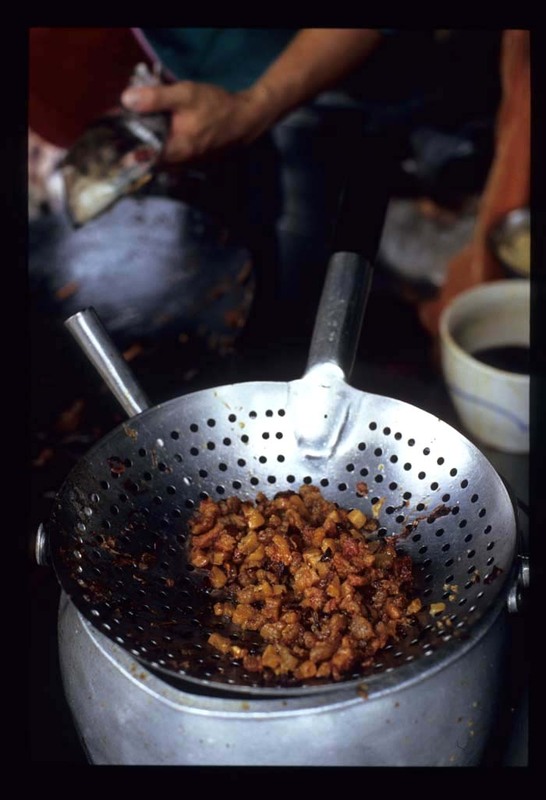 It also shows up in most stir-fried noodle dishes (including the peh kek) in the form of deep-fried cracklin' , a supply of which is replenished as needed and kept at the ready within easy reach of the brother behind the burners. 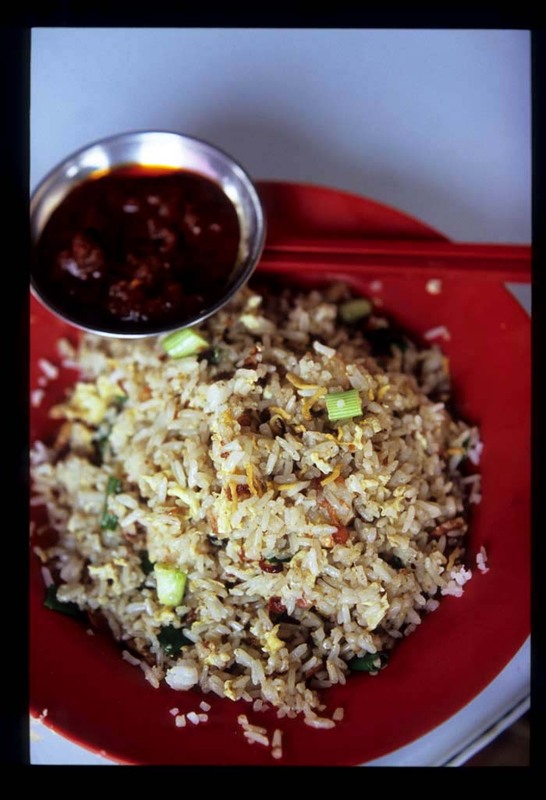 In addition to Hokkien mee, peh kek, and a few other specialties like stir-fried meehoon and fish head noodle soup, Sin Onn turns out an exemplary old-fashioned fried rice, a dish that so often misses the mark. This version boasts light, almost fluffy rice - individually distinct grains infused with fifty years of wok char. 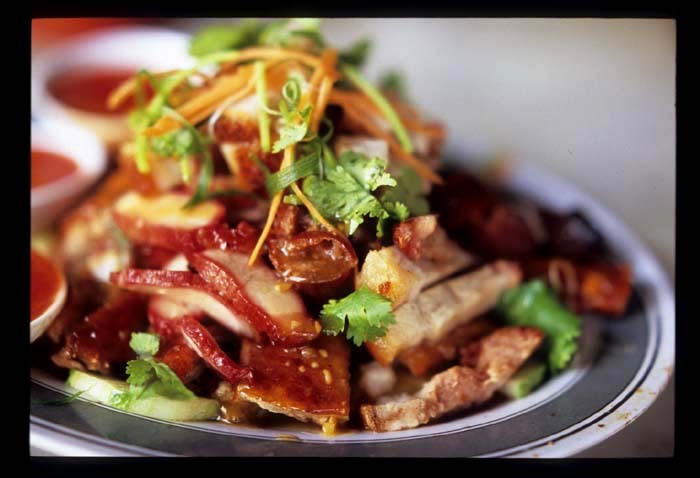 Look for the classic additions of tiny shrimp, nubs of barbecued pork, egg, and chopped scallion. But no soy. It's not necessary; the wok adds enough seasoning. 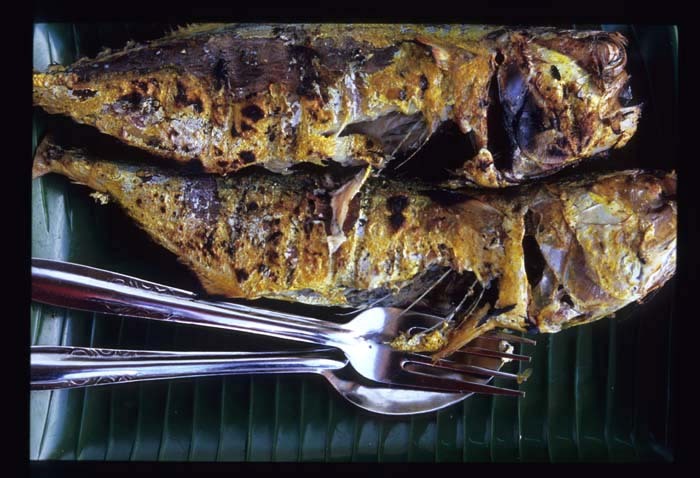 Sin Onn is one of those Malaysian gems that hearkens back to yesteryear and turns out wonderful food. If, like us, you're a fan of such places, better hurry on over. The coffee shop will be moving to new, no doubt spiffy but generic digs at the end of 2006 to make way for the demolition of the wooden shophouse it's called home since its inception. 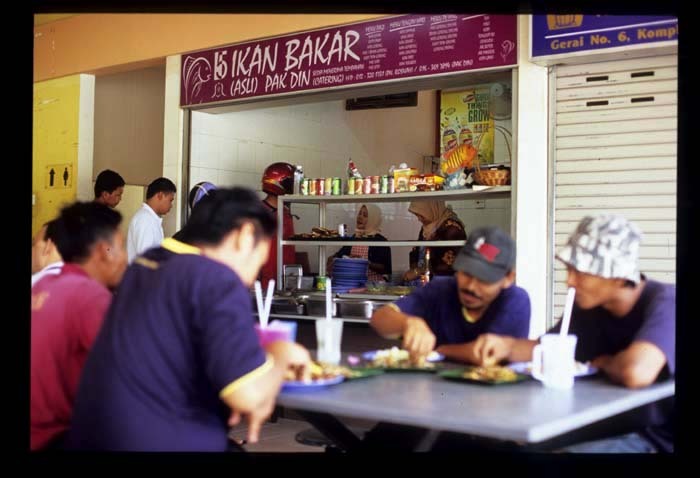 One more piece of KL's culinary history bites the dust. Many thanks to BHW, an EatingAsia reader who's been exceptionally generous with this, and other, tasty recommendations. Sin Onn, Jalan Gombak. Open for lunch from 11am to late afternoon. Closed Mondays. Directions: Jalan Pahang towards Setapak. Take the J Gombak turnoff and look for Petronas and BP stations on your left, then right after a yellow mosque, also on the left. Sin Onn will be a bit further up the road, on your right, the corner unit in the first of two wooden shophouses separated by an alley. Park out front or in the alley. Note: there is another coffee shop two doors away, but BHW warns that it is 'a poor imitator'. Just about this time last year (a year, already?) 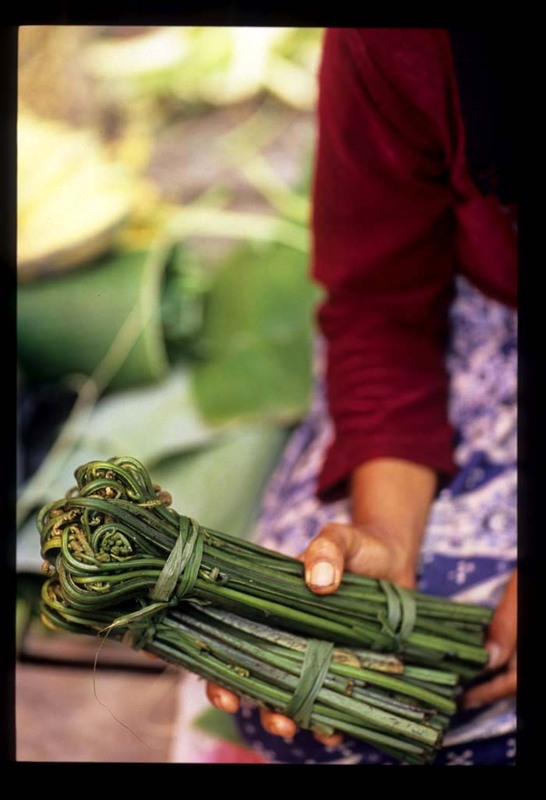 I wrote of my abiding love for fiddleheads and my bitter disappointment at not being able to source them at any of Kuala Lumpur's wet markets. Tender, delicate paku - fern tips - yes. Fiddleheads, no. Well, seek and ye shall receive, or something like that. In all actuality I wasn't seeking; I gave up on stumbling fiddleheads here in Kuala Lumpur long ago. But on Sunday evening, as Dave and I were shopping for dinner ingredients at the TTDI night market, I suddenly spied a bunch - one single bunch - of admirably fat fern stalks tipped with tightly coiled whorls even larger than the ones in the photo above (snapped at a village market on Sumatra). They were sold by a whisp of an elderly lady perched on a stool behind a rickety square card table. We've become regulars at this particular Sunday pasar malam, but I'd never seen her there before. Her offerings were limited - besides the fiddleheads, just a few small plastic saucers of chiles and several bunches of fern tips and perhaps other greens (I was too busy ogling the fiddleheads to observe closely). Needless to say I lost no time snatching up the bunch. When I asked the price, she slowly raised one finger (1 ringgit, well less than 30 American cents!). I could kick myself for forgetting to ask her where they'd come from and if she'd be back this Sunday. That night we savored my prize stir-fried as part of a meal of Indian dishes. For the fiddleheads, I adapted a recipe for stir-fried asparagus in Alford and Duguid's Mangoes and Curry Leaves (I lacked some ingredients and added one, fresh ginger), with excellent results. I do believe it's fiddlehead season somewhere in the US right about now. And I've heard that some lucky folks can find them frozen. This recipe would also work well with paku, cooking time adjusted down to account for their more delicate nature. I'm thinking the addition of a couple of handfuls of wild or oyster mushrooms (increase spice amounts) would prove very tasty indeed. 1. 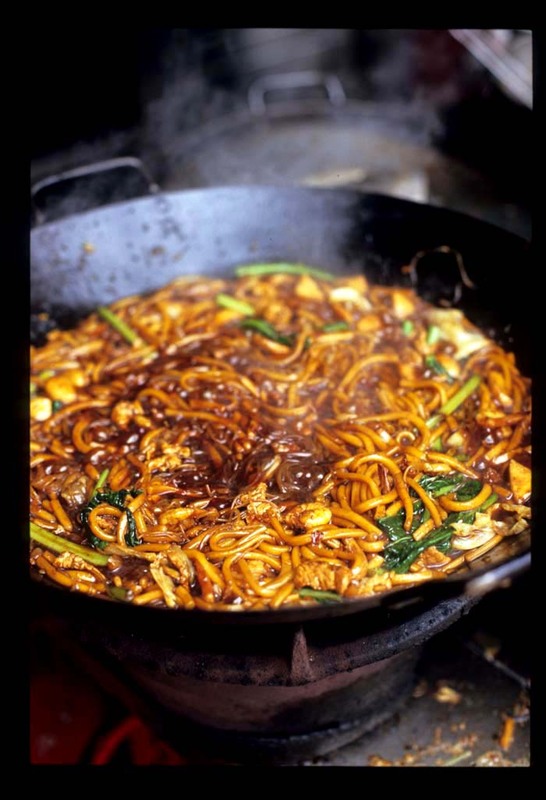 Place a frying pan or wok over high heat, add the oil and swirl to coat the surface of the pan. Toss in garlic and ginger (and fresh turmeric, if using) and stir-fry about 1 minutes. 2. Add fenugreek seeds and ground turmeric, if using, and stir-fry another minute. Add fiddleheads and salt to taste and stir-fry a minute or two. Add a couple of tablespoons of water, lower the heat to medum-low, and cook until just done (if water evaporates add another tablespoon) - not mushy, the vegetables should still have a wee bit of crunch. 3. Serve sprinkled with coriander, if you like.